【3 Light Modes & Tap Control】-- Turn on the main power button, it's warm white mode, tap on it, change to strong light mode, tap on it again, change to 5 single color light mode (Red / Yellow / Green / Blue/ Purple). Tap again, change to 7 colorful light mode. 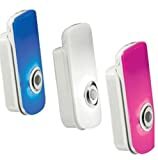 Press on the bottom power button, light totally turns off, easy to use and control. 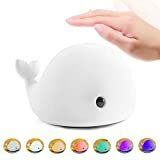 【Silicone Face】 -- Cute Dolphin face, made by BPA-free silicone, super soft touch, create a dreamlike atmosphere for your room suitable for bedroom, home display, gift and other romantic places. 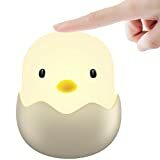 【Vibration Sensor】-- Romantic sweet nursery baby night lamp companion. Pretty sensitive vibration sensor allows you to control lights at will. 【Long Using Time】-- 800mAh Built-in battery, after full charge, warm white mode can use 8 hours, color light mode can use 6 hours. Full charge takes about 2 hours. 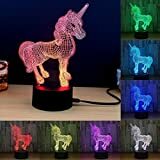 【Perfect For Gift】-- It's not only a light, but also a decorations, super cute face makes it a fabulous gift for children, girl, lady etc. Perfect for bedroom, study, baby room night decoration. Adjustable Display Angle: 45 degree tilt, allow you to project the light straight up or point in a different direction according to your needs. Perfectly fit for any Holiday Party Decorations to create an enjoyable and relaxing bedtime experience for children, soothe and comfort kids to sleep.To customers: Please choose Sold by Delicacy when you place the order. Other sellers are following us without our authorization and selling fake products. 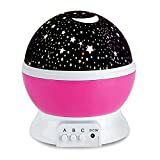 Star Projector & Night Light: SCOPOW creates an enjoyable and relaxing bedtime experience for children. Kids can enjoy a romantic stars moon show at home. 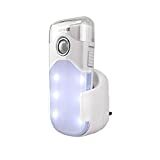 Beautiful Multifunction star night light or projector lamp. 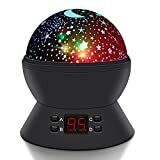 you can make it work as a night light or have a romantic projection show of the moon and stars! 4 MODES: 5 button to the lamp. RED button: On/Off. A button: set the time from 5-95min. B button: control the rotation. 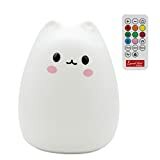 C button: color options: blue,red, green, white and multi-colors. D button: night light lamp. 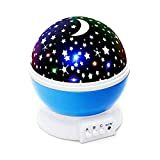 Batteries & USB Powerd: This star night light is powered by USB cable(include) with DC adapter(not included), also powered by 4 AAA batteries(not included). 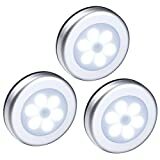 The newest generation power beads are brighter, more beautiful and have a larger projection range. INSPIRE KIDS' IMAGINATION: This is a new popular Star Projector lamp, it can help you enjoy the vagaries of beautiful star sky without going out looking for a vast heaven and earth. Children would appreciate to bring the starlight home and it can also enhance their imagination. 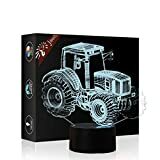 Gifts for Kids: This great night light is ideal for kids children scared of the dark at bedtime.Great decoration for wedding, birthday, parties, bedroom, nursing room. Also a great gift for birthday, Christmas, Children's Day. SALE: Take advantage of our promotion today when buying from The Builder's Yard. Purchase 3 or more products from The Builder's Yard and receive a 5% discount on the total price. 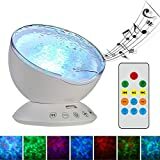 7 LIGHT MODES: This night light projector can project colorful lights on the ceiling or walls to create a romantic, relaxing and delightful atmosphere. 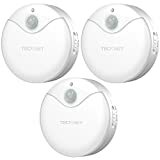 TOUCH SENSOR & REMOTE CONTROL: The buttons are touch sensor. And with the remote, you will find it easy to operate. AUTO OFF TIMER: You can set auto off for 1hr/2hrs/4hrs in case that you forget to turn it off and fall asleep. TF CARD READABLE: Using a TF card or audio wire(provided), you can choose to play your favorite songs by connecting it with your phone, pc or MP3. 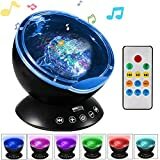 ANGLE ADJUSTABLE: This music projector can be tilted at most 45 degree, you can project the light straight or point in a different direction according to your needs. 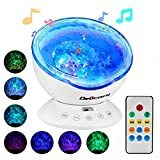 Perfect for home and party. 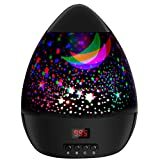 Adjustable Projection Angle: This ocean wave night light covers the whole ceiling in your bedroom with brilliant waves aurora light show, really amazing stuff! The adjustable 45 degree tilt allows you cover the brilliant light on the whole wall or a different direction according to your needs, beautiful like the northern light. 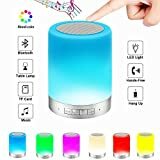 5 in 1: Super multifunctional, Bluetooth 4.0 speaker + Touch Control Design + Dimmable Night Light + MP3 Player + Hands Free Call. It is made of PLA very durable and light, you can take it to anywhere as you want. Perfect decoration for bedroom, living room and office. 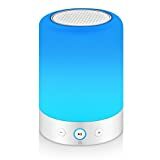 BLUETOOTH 4.0 HIFI SPEAKER: Connected easily to any bluetooth-enabled devices with the help of high power woofer and unique bass technology. 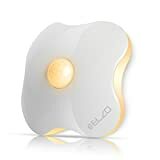 It supports TF Card and AUX Line, when your phone is out of power or the network is not very good you can use them function to play your favorite music. 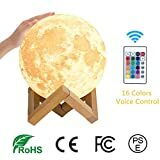 TOUCH CONTROL & DIMMABLE NIGHT LIGHT: Just tap the speaker's top if you want to adjust the brightness level, very interesting. 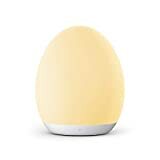 In your bedroom, the dimmable night light help you to create a colorful world for your friends and kids. RECHARGEABLE LITHIUM BATTERY: Super long playing, super long lighting. Internal lithium battery recharged by usb within 5 hours, very environmental and convenient. Multifunctional creative and modern design make it the best gift choice for many occasions, such as Yoga, Party, Camping. 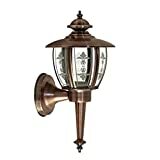 Wall sconces- illuminate any exterior area, with their antique lantern style and unique wall paneling that will add any property to the decorative element. 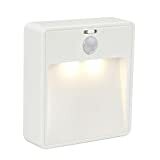 Waterproof wall lamp -is very suitable for use in the garden. Gold black metal gives the retro charm of the wall lamp to enhance the modern or ancient architectural style. Wall Light LED - Unique integrated Built-in LED technology offers instant light with a warm & functional glow which will illumiate & compliment the surrounding area. 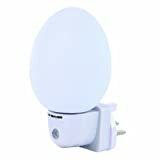 Waterproof Garden Light - security lights and illuminated gardens, paths, patios, garages, terraces, porches and driveways. Traditional Outdoor Wall sconces - Traditional Design lantern clear glass in deco lattice Can be wall mounted , lightweight aluminum. 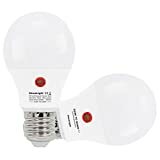 SinceLight DUSK TO DAWM LED Sensor Light Bulb(V2.0), Equipped with dual ingenious daylight sensors,It turns ON at Dusk and OFF at Dawm by its own, More comfortable lighting experience at LOW COST. Preference for OUTDOOR use in IP65+ Fixture, As the bulb detects DayLight only in order to prevent lighting interference, So it is not recommended for indoor use, as the daylight level is unstable in this condition. SECURITY IMPROVEMENT: Reduces the investment on costly security light and save 90% electricity costs. LONG LIFESPAN : Designed with 25,000 hours of rated lifespan, And 18 month global warranty by SinceLight. Lower maintenance frequency that saves time and costs. 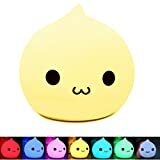 【Detachable & Washable Silicone Face】-- Super cute drop face made by BPA-free washable silicone gives a pleasant soft touch. 【Dual Light Modes & Tap Control】-- Press the base button to turn on/off. Tap the soft silicone surface to switch among normal white light mode, 7-color breathing light mode. 【Power Supply】-- Powered by 3PCS AAA (Not included) battery, energy conversation and environmental protection, hurtless to eyes. 【Perfect For Gift】-- Suitable for gift giving for especially for girls, babies and kids. It keeps your beloved ones company as a tender guardian all night long. 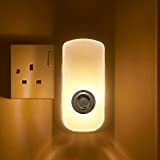 Stylish Design - circle shaped and compact sized lights act as little decoration to your home. Perfect for your bedroom, bathroom, stairs, hallway, kitchen, closet, etc. 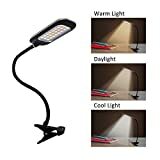 【Comfortable & Adjustable Brightness】Designed with 4 LED bulbs (40lumen), which gives out natural and non-flickering light that won't hurt or strain your eyes. And there are 2 light modes, you can adjust the brightness simply by clicking the button. 【USB Rechargeable Battery】Extraordinary battery life with 1000mAh built-in rechargeable battery and USB charging cable, you can use the night light last up to 10 hours after fully charged, and the indicator light will turn from red to blue when it's fully charged. 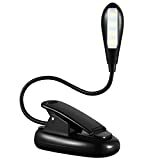 【Portable & Flexible】The book light features mini size and compact design makes it very easy to carry. Sturdy and flexible (360 degree) goose neck allows you to position your light anywhere you want. 【Multiple Uses】Designed with extra padded clip that not to damage any objects, so it can serve you well for multiple uses for books (night-time reading),kindle(E-reading) reading in bed, shelves, cupboards, computers, laptops, desktops, pianos, music stands and much more. ECO-FRIENDLY-- The star is made of Eco-friendly vinyl material (food contact material). 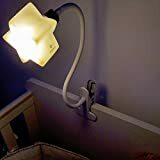 The Star can be removed, so the lamp can be used as a reading lamp/desk/office lamp, both for adults and kids. 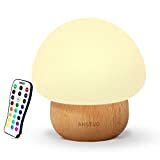 4 BRIGHTNESS MODES-3W LED light bulb. The lamp provides 4 lighting levels that can be easily switched by a simple control button. Great lamp for Breastfeeding mums/ to be used as a reading lamp. STRONG & FLEXIBLE CLIPS--Sturdy clips with extra strong clip grip, allows great versatility, suitable on baby cot, bed-frame, office table, study room desk, and many more. 360 degree adjustable gooseneck, so the clip can be easily bended to a compact position. Gooseneck length: 40cm. 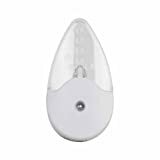 EYE-CARING--Eye-caring LED bulb provides soft & warm light. 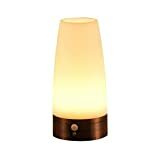 Pleasant lighting, reduce eye fatigue and ideal for over night use, reading, studying, working, etc. POWER SUPPLY--Powered by USB cable so can be plugged into a USB port on your computer, power bank or other USB power device or to the wall by using a USB plug. 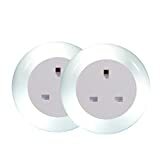 UK plug adaptor included. Cable length: 120cm. Energy saving. 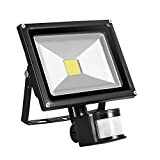 Power spend: 0.012kW.H/24 hours; LED Life Span: 100000hours. Ideal Brightness: Not too bright or too dim, but bright enough to lead you through the darkness without bumping into things. 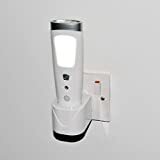 Intelligent Sensor: Built-in sensitive PIR light sensor, auto-on when detecting the human motion within 10 feet/3M in the dark, auto-off after 20 seconds of no motion detection. Energy Saving: No external battery required. With 550mAh rechargeable battery can support constant light for 2 hours and last 60 days on AUTO mode. 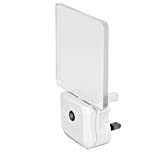 Easy Installation: Comes with 3M adhesive pads , no need of wires and screws, just stick it to anywhere you like. Widely Application: Perfect choice for nursery room, Children room, bedroom, basement, hallway, washroom, kitchen, balcony, corridor, stairs, closets, bookshelf, backyard and cabinets.